We've been enjoying some lovely weather in Ireland recently. 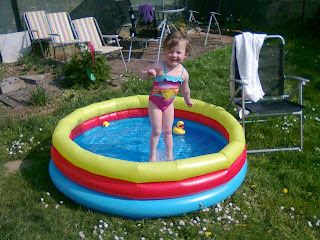 So yesterday when smem wanted to get a paddling pool i gave in and bought one - it was only 9 euro. And it was a bit hit, once the water warmed up a bit! This seemed to take forever to knit, but I think that's just cause I was so busy last week and didn't get to knit every day, as per the norm! Love the picture in the book, did not like it while knitting it, and its sorta growing on me now. It just seems far too wide - 24'' around the waist. (Smem is 3 years old and her chest is only 21'' and she's not a small girl!). Might have to add some elastic to the waist to cinch it in a bit, but will wait to see how it fits. 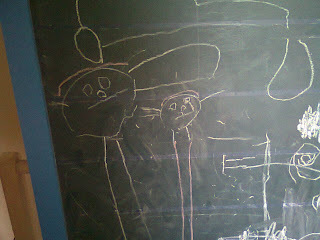 Smem has taken to drawing little characters recently. they're pretty cute! DH has taken Smem to the playground so I've had a few minutes to sit down and type up a pattern. My poor blog has been a bit neglected of late - sorry about that. Not helped by the fact that this week is Holy Week for Easter and I've been singing at various masses and prayer services every second night. So here are a few pics of some patterns that will be available soon (whenever I get to type them up!). And some will be free!!!! In baby news, I'm at week 38 now so nearly there. Very fat now, and starting to get very itchy, so fingers crossed I don't have too long left. 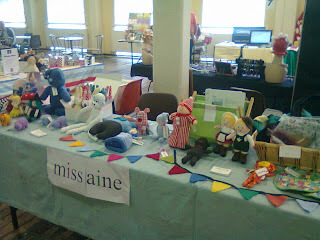 Photos from the market,taken on my phone so apologies for the poor quality! Another quick toy for the market. This time a pattern from Sew Daily - Pretty Cat, Baby Bear and Mini Mouse. I actually bought this pattern for the Pretty Cat, who I think is rather pretty! but have yet to make the cat!! I think this guy needs a bowtie or something. Made for the market this Sunday. I used a pattern from here. Normally I don't like to use other people's patterns to make toys to sell, but I had left it rather late to prepare for this market, and I'm too tired and pregnant to come up with my own ideas. Its a really easy pattern to follow and can easily be customised to suit any situation or colour scheme. I'd say any of these that I don't sell will live on as gifts for new babies in the future. Either that or I'm going to make bunting with them in the kids room when they're both in the one room together. A little monster, based on the Tag Monster, made for Smem today. She picked out the colours and fabric. I just used the leg pattern for the arms and omitted the tags. I think it only took about 1-2 hours in total to make which is nice and quick for last minute presents. And, as I'm doing a market this weekend (last one for a while!) I might whip up a few more over the next few days just to fill in the table a bit. A cute snuggly teddy/monster knit for an upcoming craft fair. The pattern is by Jean Greenhowe - who else! In other news, i.e. baby news, I had a scan at 34 weeks to determine the size of the baby. Its already 6lbs, and should put on 1/2 lb every week til its born. So I'm looking at another 9lb'er. Woo hoo! From 'The Knitted Nursery' book which I got on Friday. Its a really cute book with some cool projects for kids. Quite a few require foam as they need really solid shapes underneath the knitting. This is the cot bunting pattern. The book uses a ribbon to join all the triangles, but I decided to attach them with an i-cord which I knitted onto the end of each triangle. A few months ago I found a pattern for a cute coat/cardigan for Smem on Ravelry. The pattern is part of a children's storybook about a little mouse whose mother knits her the cardigan when she is pregnant with her second baby. The book is called Phoebe's Sweater and is available directly from the husband and wife team that have self-published it. It contains the story, plus knitting patterns for the cardigan, the mouse and some clothes for the mouse. Hopefully Smem will like it! Just need to give the cardie a good press and sew on the buttons. At least I got it done before the baby is actually born. I spent today, Mother's Day, at the Peas and Pods market in Dublin. It's a relatively new market, aimed at kids and stuff for kids. I was sharing a table with Lucy from Si + Lu. They make handmade knitted clothes for kids, and the wool is sourced in Ireland and the knitters are all in Ireland. Jumpers and cardigans can be made to order at the moment if you contact them through their website. Unfortunately, on account of it being mother's day it was very quiet. I think everyone was out to Sunday lunch with their mammies. Still I made enough to pay for indian takeaway this evening!